With the end in sight, Star Trek Discovery season 2 stops messing around and gets down to business with a revelatory episode about the Star Trek Discovery Red Angel, which moves the story forward, but leaves more than a few plot holes in its wake. The Red Angel is full to the brim with shocking revelations and a shining performance from Sonequa Martin-Green as Burnham, but the central plot leaves much to be desired in terms of logic - let’s hope the show can straighten everything out before the finale! With some story spoilers from this point on, here’s our verdict on Star Trek Discovery season 2, episode 10. The Red Angel starts with a goodbye to Airiam (Hannah Cheesman), which, like most of episode 9, is effective, but feels a little out of place given we didn’t even get such a significant sendoff for Culber (Wilson Cruz) in Star Trek Discovery season 1. Once everyone’s dried their eyes, they get down to the business of trying to figure out who or what the Red Angel is with the ‘help’ of Section 31, and less than 10 minutes into the episode, the bomb is dropped that the Red Angel is in fact future Burnham. Armed with the knowledge that the time travelling Red Angel is someone they know and trust, and is clearly trying to stop the apocalypse that Spock (Ethan Peck) has foreseen, no one wonders whether they should just let her get on with it, and instead devises a clever plan to capture the Red Angel. Yeah, that makes sense. There’s lots of problems with this course of action, not least of which the time travel element. If the Red Angel is indeed future Burnham, then wouldn’t she be aware of any plot to capture her in the past? Maybe, but honestly, time travel conundrums come in all shapes and sizes in sci-fi storytelling and the only thing they all have in common is that none of them make any sense. Ignoring the headache-inducing implications of time travel, the Discovery crew plow full steam ahead with trying to capture the Red Angel, so they can… ask her what’s going on. It feels like a pretty extreme course of action given how dangerous messing with time travel can be, not to mention the fact that the Discovery crew realise the only way to force the Red Angel into their trap is to threaten Burnham’s life. Cue a hilariously dangerous and nonsensical mission! It’s not all bad though. While episode 10’s main plot leaves a lot to be desired (and more than a few plot holes), everything around it is still Star Trek Discovery-levels of excellent. Anyone who’s still not sure about Martin-Green in the lead role (anyone?) will surely be convinced by her performance in The Red Angel, which is some of the best acting seen on the small or big screen in recent years. Whether it’s her subdued grief and understanding directed at Tyler (Shazad Latif) after Airiam’s funeral, or the defeating rage she attacks Leland (Alan van Sprang) with after he reveals his role in her parent’s death, this episode reminds us why Burnham is at the center of things. Plus, the continued banter with her brother, Spock, is still one of my favourite things about the new season, offering moments of genuine humour amongst all the doom and gloom of the on-coming apocalypse. 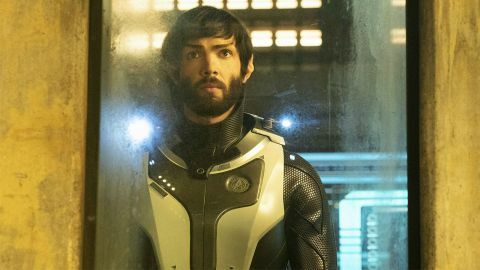 Sadly, Burnham seems to be one of the few original Star Trek Discovery characters who is thriving in the second season. Culber is still floating around, somehow involved in missions while not actually being back on active duty. Tyler doesn’t really have a role separate from his relationship with Burnham (which does the character a great disservice considering his epic role in the first season). And Georgiou (Michelle Yeoh) continues her weird, so-far unexplained character change from cold-blooded murderer/dictator to caring mother-like figure. While fans rightly rejoiced about the return of these characters which made the first season so good, we’re now ten episodes into season 2 and it’s looking like the show doesn’t really know what to do with them. There’s still time for this to change (we’ve got four episodes of season 2 left), but if Georgiou’s change of heart is never explained, Tyler remains merely a love interest, and Culber’s story continues in limbo, it will be a disappointing end for some of the best TV characters of all time. Let’s not sugar coat it, The Red Angel is a middeling Star Trek Discovery episode at best, and it’s looking like, despite a strong start, the second season is struggling to live up to the dizzying heights of its debut. But one thing episode 10 does do is drastically move things forward and end on a huge cliffhanger, which will surely keep the momentum going. Heading into the final four episodes of the season, this can only be a good thing and while there’s a lot that doesn’t make sense about this episode, that’s time travel for you, right? If you can’t suspend your belief for the length of this episode, you probably shouldn’t be watching a Star Trek show, so while we’ve come to expect better from Discovery, episode 10 is hardly a travesty. Plus, if I haven’t already said it enough, Martin-Green is the bomb! Don't miss any of the other best new TV shows with our breakdown of the top series coming soon.